We work closely with the NHS, academics, local government and industry to improve health, generate economic growth and put health innovation into practice. If you would like to speak to a member of our team regarding an idea or innovation, please contact us and we will respond as soon as possible. Alternatively, you can complete our Business Connect enquiry form and we will get in touch. Our Innovation Pathway highlights the key stages – from conception to completion – where the Innovation Agency offers support, advice and expertise to innovators. 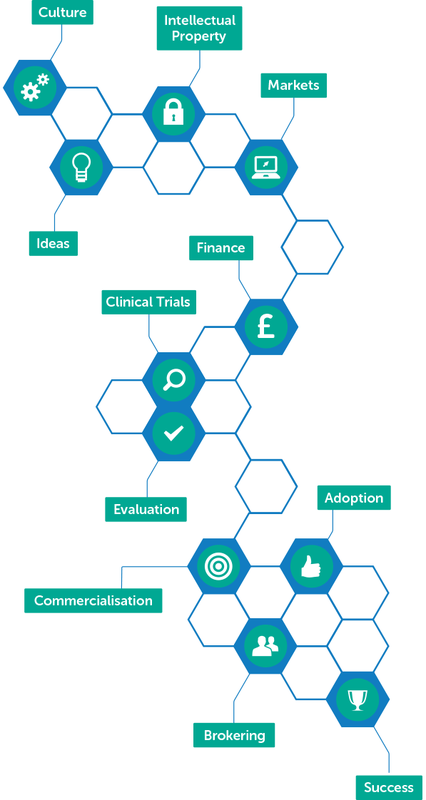 Whether wanting to further develop your idea, needing advice on navigating the NHS or help in undertaking clinical trials, building potential partnerships, or funding and commercial expertise, the Innovation Pathway outlines the support available at each stage.